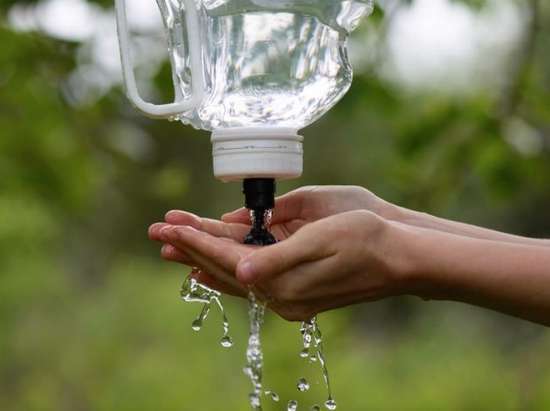 Do you do a lot of work outside or enjoy activities like camping, but lack access to a creek or have water for washing your hands? Washing your hands is important and can easily be done using any container that can hold water. A great idea is to make a portable washing station. A plastic jug is all you will need to make a portable washing station. This means you can easily recycle or reuse any container that has a plastic cap. You will be attaching a tap to the cap to dispense the water to wash your hands or face. Any jug that fits the modified cap can be used. The best thing about a portable washing station is no electricity is needed as the water flows by gravity alone. All you need to do is hang the washing station from a tree branch. Simply pull on the tap for the water to come out.